Not long ago I thought I needed a break from my life and travel to foreign places to find out who I really am, what I really want to do in my life and where I want to live. I thought I needed a break to become who I want to be. That I needed to be far away. On a beach. With nothing to do but to enjoy my life, feel into everything and let the universe make happen what is needed to follow my path. I still understand why I was thinking that. But now I also know it won’t help become who I want to be. Because I already am. But let’s start from the beginning. 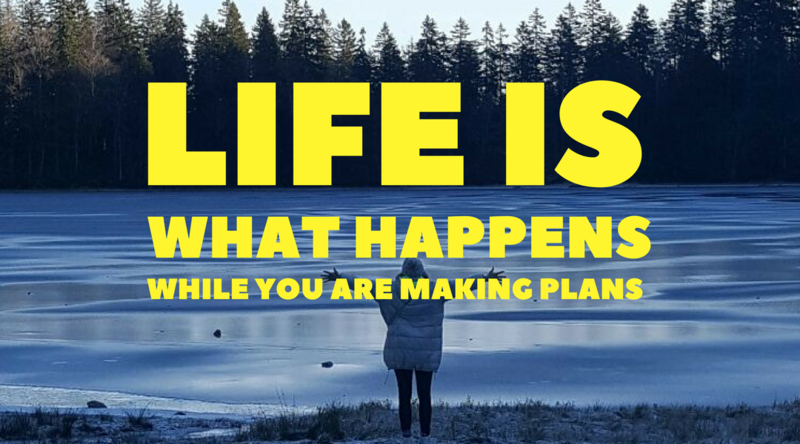 This is probably why the expression “Life is what happens while you are making other plans.” exists: I had just made the first steps to become free. Like quitting my job to be independent from a location and therefor free to travel whenever I want. I had started to clean out some stuff – lots of stuff to be honest. What helped me doing so is the blog http://www.theminimalists.com where Joshua and Ryan are supporting people to change their lives by just minimalizing and focusing on what is really important in life. While I was letting go and getting into the process of making life changing decisions somehow the universe also made some moves for me. Due to a few happenings around me I found myself thinking or better mainly feeling into the question where I want to live. I realized that whenever I had a free weekend or some days off my heart was leading me to Munich. Not only because it is where my best friend is living and with her a really nice circle of friends that already have adopted me into their activities a few years ago. Furthermore it is the city where many of my really long time and very good friends I call my family still are located. Well, I must admit, I had already realized that a huge part of me was connecting a lot with Munich when I had my birthday party in January: Some of my closest and longtime friends are living in Munich or are moving back there soon again. Probably because I was flying to Hawaii the next day for a few weeks and therefor was influenced by this for that “let’s go abroad” idea I did not follow my gut feeling I had already have had on my birthday party. The following months after coming back from my trip to Hawaii I was thinking a lot about the essential questions in life: where I wanna live in the future, with whom I would love to spend more time in my life and what is really important to me. Every now and then I remembered myself to not put too much energy in thinking but let the universe do its work and lead me. But you know how well this works for us with these big questions in life… So while going back and forth and through all options life has to offer and even let it flow a bit I suddenly found myself inbetween some of my best friends in Munich the last weekend. I had had a meeting in Chemnitz during the week and had decided spontaneously to not go back to Hamburg but move further on to spend the weekend with my loved ones down there. On a friends birthday then happened what I call a hint by the universe. If something like this happens we have to be alert and conscious to recognize it as an opportunity given by the universe to follow our personal path. While talking to the husband of my friend I was mentioning that I am preparing to move but don’t know where I will end up and that Munich might also be an option. To be honest I was even surprised to hear this myself and immediately asked myself why I had said it, whether it was only to please the husband or whether this was really an option for me. Still having that thought running in circles in my mind, he introduced me to another friend of his who was looking for someone to sublet his apartment. Coincidence? This other friend happened to just need another kick himself to finally make the next move in his life. And he was not ready yet to fully give up his apartment in Munich. That’s why he was looking for someone to sublet and not rent, which on the positive side also opened up a flexibility from my side. While already talking about the conditions of how and when to move into his apartment, the scales fell from my eyes: I do not have to go far to find what I am looking for. I do not have to be with new people to become who I truly are. I do not have to leave everything behind, to have this huge step into my life and start over brand new. I just need to be myself. I just need to be where I feel most comfortable surrounded by the people I love and where I can be who I am already. Like I say in my coaching program Love Yourself More: prepare yourself for the life you want to live. And then let go, open your heart and let the universe do its thing. I am really excited for this next chapter in my life.